Ah, the inbox. It’s one of those places that many of us spend so much of our time. Unfortunately, this familiar space is often one of disorganized chaos as well. Case-in-point, for the last month or so, my email inboxes (personal, work, and blog) were out of control. They overflowed with special offers and updates, which often meant the important information got buried amidst the noise. If so, then you’re probably not surprised to learn that this clutter can simultaneously increase your stress levels while decreasing your productivity; and this is especially true if email is a significant component of your job. But don’t worry, there’s good news here, too. 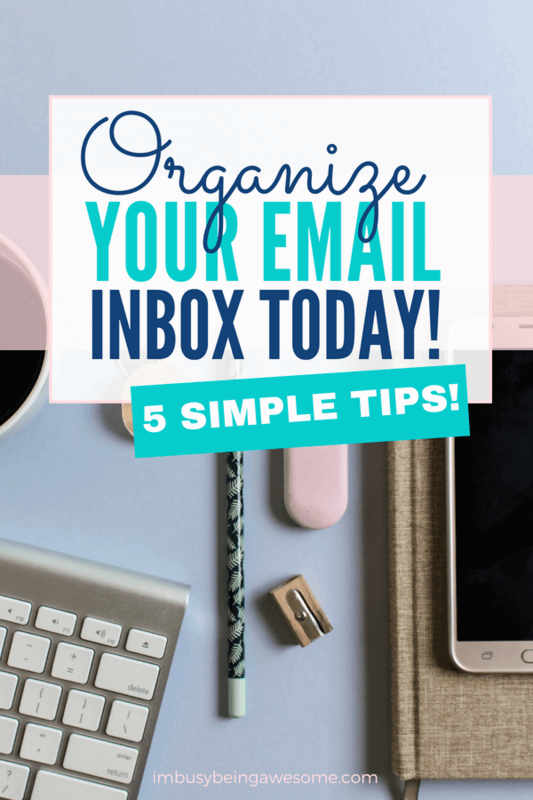 Over the last few weeks I started using five email organization strategies that helped me get my inbox under control, and today I’m excited to share those tips with you. Unsubscribing from unnecessary emails may seem like an obvious suggestion, yet how many of us continue to click “delete” rather than “unsubscribe” on that constant stream of junk landing in our inbox each day? It’s such a little step, but think about the positive long-term effects it will have when those dozens of unnecessary messages stop landing in your inbox. Alternatively, you can sign up with a website called Unroll.me, which is a free service that delivers a “round-up” of your subscription emails each day in one tidy email. I love it! Many email providers allow you to create folders and tabs within your inbox. By sorting messages into different groups or categories, you can easily find the messages you need when you need them while reducing the visual clutter of your inbox. Take a few minutes to create separate folders and then get sorting! While folders are helpful for keeping your messages organized, they are less useful when one message fits into multiple categories. By applying tags to your emails, however, you can mark them so they are sortable later. You can also assign multiple tags to a single message, which allows you to reference them for different situations. For example, I might receive an email with information about a meeting, but it also has resources attached in a document. By tagging the email with both “meeting” and “resources,” the email will come up when I search for both terms. Your inbox has a search bar, which you can use to find important emails quickly. Simply type in a name, email address, or phrase that you remember from the email, and the ones that match your search will pop up. With this approach, if I ever need to reference a particular student’s assignment or count up their absences, I can enter their name in the search bar, look through the archive, and find the important emails quickly. Many email providers let you set up filters that automatically organize incoming messages into specific groups. For example, if you’ve unsubscribed from an email, but the company continues to send information (I’m looking at you Self Magazine! ), you can set up a filter that automatically pushes their email to the “junk” folder. Additionally, you can use filters to sort incoming messages into different folders depending on the sender, subject, or keywords. This is a great time saver, as you don’t have to sort through the emails yourself, first. Yes, please! 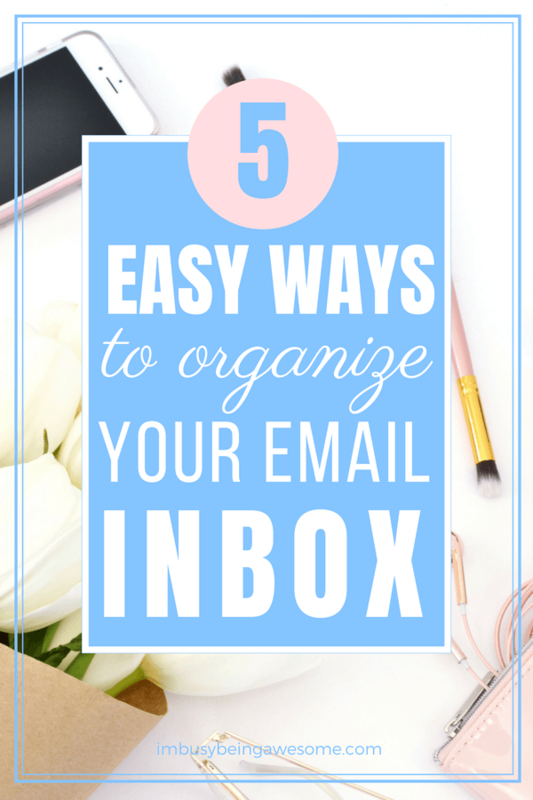 There you have it: 5 simple email organization strategies just for you. While setting up these tools may take a few minutes, the amount of valuable time you will save in the long run is well worth it. Give them a try today! 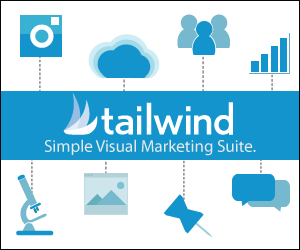 What are your favorite email organization strategies? Are you overwhelmed by emails? Share your thoughts below! Looking at my inbox really gives me anxiety! This post is so helpful! I’m so glad to hear it’s helpful, Marta. Thanks! It’s like you looked into my inbox and knew I needed help! Seriously, my email has been out of control. I really needed these tips! I hope they help, Christa! It is crazy how disorganized my inbox is, I really need to take the time and your tips to clean it up. I love this! I haven’t utilized gmail yet, but so far I’m using labels, filters and aliases! I love how easy it is for me to read my emails and I don’t have to manually move it to different folders. I don’t like it when I have unread messages, so as much as possible, I make sure to read everything and lessen my emails. I have to unsubscribe if I don’t feel like I need it anymore. I have SO many e-mails, and they pile up faster than I can manage. I really like these tips and saving important ones in a special place! It’s amazing how quickly the pile up, isn’t it? 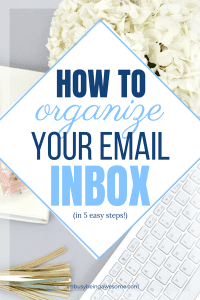 I could probably (definitely) stand to do an email declutter…thanks for the tips! This is great. I need to sort this out. I have started making categories. It’s just so busy! It’s fantastic that you’ve gotten started 🙂 Once you get the plans in place, things will be much easier. I need to save this post! I am so disorganized!! 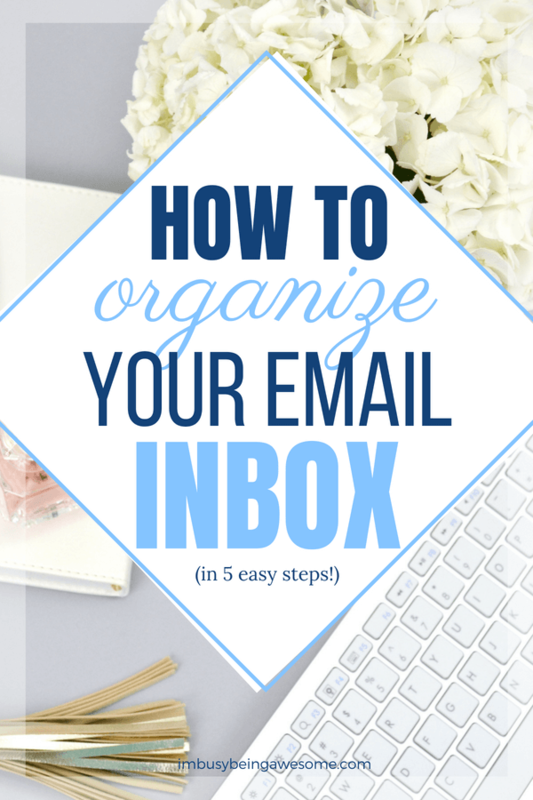 Thanks so much for your great organizational ideas on controlling email. I’m starting to get a lot more emails now so this will come in handy! Awesome tips. My inbox currently has 110,736 unread emails. UGH. I will definitely put your plan into action. I use all of these strategies !! Great minds think alike ! !